We have links to a wide selection of hotels in Florence divided into those in the Historical Center (inside the city walls) and those in the City Center (outside the city walls, but still close to them). Prices for hotels in Florence are, on average, quite high. But StudentsVille has found hotels in every price range, from cheap hotels in Florence Italy to 5-star suites, so you won’t have problems finding the best one for you or your family! Studentsville has chosen not only the best cheap hotels in Italy Florence but also with comfortable and spacious rooms so whether you are looking for a romantic stay or simply a place to relax as you discover the happenings in Florence you are sure that here you will find one of the best hotels in Florence. We are sure that you have red so much on the internet about how small hotel bathrooms in Italy, can be but you will be amazed at the ones of our selection! Even if you find one of our selected cheap hotels in Florence Italy in the rooms you will find large showers and spacious bathrooms and sometimes you can even find an emergency cord in the shower. An excellent idea if you fall or you need help! So if you are considering the idea of staying in one of the hotels in Florence you might be asking yourself in which area of Florence should you stay. The center of the city of Florence is actually quite small and you pretty much can walk everywhere! If you arrive by train or you want to remain close to the train station we have selected some hotels in Florence Italy near train station of Santa Maria Novella (SMN) and just live 5 minutes walk away from the Duomo. The nearest one is the hotel Santa Maria Novella Florence that is central and panoramic positioned in one of the most beautiful squares of Florence where small-sized pets are allowed at no extra charge! If you want to live in the Florence’s oldest streets the Borghese Palace Art Hotel, is an excellent choice, especially if you love art because the Borghese Palace Art Hotel hall provides the ideal location for the monthly exhibitions of works by international artists. It is not easy to choose from the various Florence Italy hotels. We know! There are too many options, but hotel Brunelleschi Florence is one of the only solution if you want to experience to stay in a byzantine tower. This hotel in Florence Italy was created within a circular Byzantin tower of the 6th century and a medieval church where you can live an authentic italian experience. If you love to see the river from your window hotel Lungarno Florence, is the ideal solution for you! The living room of the hotel Lungarno Florence, is suspended over the river and the hotel has an impressive art collection that accompanies the guest to their rooms. 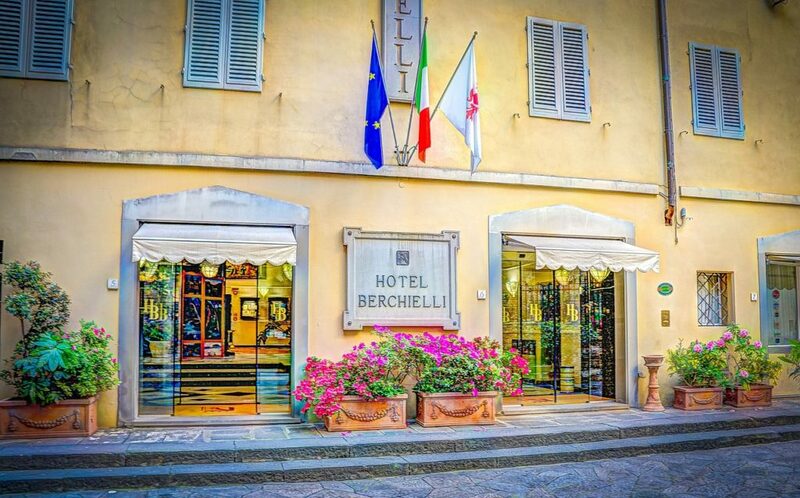 This is one of the best hotels near Ponte Vecchio with rooms and suites, many of which with beautiful terraces overlooking Renaissance masterpieces. If you want to be in the heart of historical centre of the city and enjoy a stunning location, hotel Duomo Florence is the ideal choice! Situated just a few steps away from the world of art and culture that Florence offers where you can feel at home away from home. Hotel Duomo Florence is the only one of the hotels in Florence where you can have a view and feel like you are touching the Cathedral with your hands! So what are you waiting for? Just start your hotel hunting from our selection of the best hotels in Florence for every budget! From luxury to cheap hotels in Florence Italy, where you can live your unique and unforgettable experience!!! Prices for Hotels in Florence are, on average, quite high. But studentsVille has found hotels in every price range, from budget hostels to 5-star suites, so you won’t have problems finding the best one for you or your family! This area, the historical centre, the ring, is the boulevard built as you can see from the map Florence Italy city center, (https://www.studentsville.it/map.html). The boulevard built is the ancient part of the 13th century walls that circled the city and demolished in the 19th century. Just have a look at the Hotels in Florence Italy city center that Studentsville.it has selected especially for you and choose the one that suits your requirements. With so many choices available is shouldn’t be too difficult to find one!!! For ‘Florence City Center‘ we mean the area of the city that is still part of the Municipality of Florence, but not included in the small and walkable historical center, that contains almost all of the main sights of Florence and it makes lots of sense to stay in the historical center particularly if your time is very limited and want to see most of the main sights especially if you have a short time due to your itinerary. From the Hotels in central Florence selected in the area of Florence Italy city center it’s very easy to reach the historical center on foot in no more than 10-15 minutes, from a non-polluted neighborhood and it is a well-frequented by the city bus system. If you choose to live in the Hotels Florence Italy City Center located you will have the main advantage of lower costs per night and it is going to be a better solution for your accommodation Florence City Center, if you prefer a highly residential area where you can experience the daily Florentine local life and especially if you arrive by car. It is highly recommended parking outside the historical center especially if you want to use Florence City Center as your base to visit other areas of Tuscany on day trips. Florence City Hotels might offer private parking in addition to the street parking available in the area so this is another benefit. In this section of Studentsville you will find the best solution for your accommodation Florence City Center that we would recommend staying in, without being too far away from all of the sights that Florence has to offer! Looking for a cheap accommodation in Florence, Italy in the historical city? Wanna spend a “low budget holiday” in Firenze and in Tuscany? On StudentsVille.it you’ll find the best and the widest selection of cheap accommodation in Florence Italy and the best low budget accommodation in Florence Italy like cheap Hotels in Florence city centre, hostels and b&b of the web! We personally know most of the cheap accommodation Florence situated like cheap Hotels and Hostels listed here so, if you want a special recommendation, you can also send us an e-mail and we can help you to find the best budget accommodation in Florence Italy for your perfect stay in Florence!!!! A studentsVille dinner – SCHOOL TRIP TO FLORENCE, ITALY? Cheap accommodation Florence city center situated and hotels for schools and university trips. If you also need some advice about the museum booking, the live events of the period of your stay in Florence and everything else you may need to organize the best possible trip to Florence the studentsVille staff will support you in every moment…. The service is totally free and guaranteed by the studentsVille organization to find cheap accommodation in Florence Italy!